The Red Raven Spy Mission can be carried out by your mini spy in any location. They will need a pencil or pen and access to the Kids Spy Network Headquarters’ website. 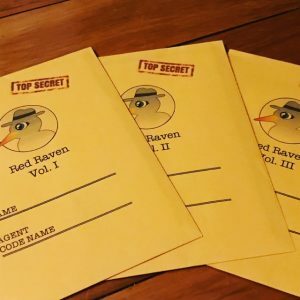 This series of spy missions (3 in total) is ideal for primary aged kids (although younger children might just need more help) who like to crack codes and solve puzzles. SHARING or TAGGING a friend to the website tour video on my Facebook or Instagram here. Like or follow ‘Kids On Board NZ’ and Kids Spy Network on Facebook / Instagram to receive updates on other promotions and entertainment for kids and families (not mandatory). For more information about The Kids Spy Network including other spy missions available, please check out their website here. NB: This competition is running until 10am Monday 8th January 2018. The Red Raven Spy Missions can be used at anytime. Kids on Board would like to thank The Kids Spy Network for their generous donation.